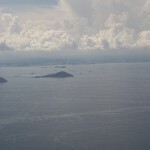 On the plane flight in, I could see ships in Panama harbor waiting to enter the canal from the pacific. 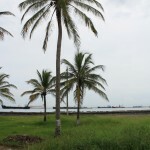 Ships line up on the Atlantic side in Limon Bay. 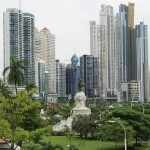 A statue of Vasco Nunez de Balboa stands amidst the sky scrapers of Panama City. 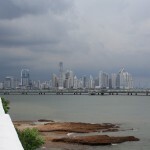 A glimpse of the skyline from the “Old New City” of Panama. One of the architectural triumphs. 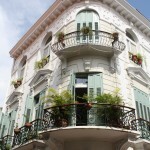 A restored building in the historic district of Casco Viejo. 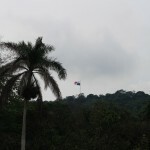 The Panamanian flag flies from the top of Ancon Hill in the former Canal Zone. A mural illustrates the fraught history of relations with the United States. 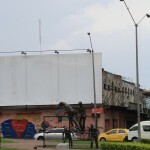 A memorial to the students who risked their lives to assert the dignity of Panama. Some of them died in the protests. 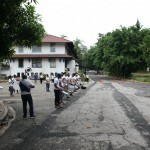 Community drum and bugle corps are a significant activity for young people in Panama. Sunday afternoons are filled with the sound of groups practicing. The bugles play at a particularly attention-grabbing pitch. As practice ends, the groups march in the streets, sometimes blocking traffic. 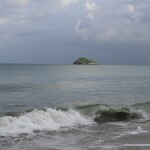 Panama’s natural beauty includes mountains, rain forests, and beaches. 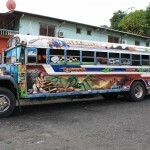 Colorful buses, called “Diablos Rojos” or “Red Devils,” provide the primary means of public transportation. 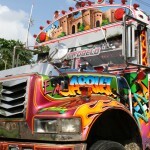 Every bus is privately owned and reflects the personality of its driver. It’s sometimes hard to absorb all that is going on. I might have gotten a little obsessed with the Diablos Rojos. Almost a month ago, I packed up the largest suitcase my family owns, kissed my wife and daughter goodbye, and took off to the Republic of Panama for three weeks. I had no idea what I was doing or why I was doing it. Mostly, to channel Cool Hand Luke, it seemed like a good idea at the time. Somewhere in the Miami airport, as I changed planes amidst roving packs of adolescent missionaries in matching t-shirts, I realized I was about to spend the better part of the month with people I had met once, by Skype, in a place where I did not know the language and which was separated from my home by at least four countries, one of which is Mexico. And I’ve been warned against driving through Mexico for the time being. So, I guess it was going to be Panama for three weeks. In preparation, I had read David McCullough’s book about the canal, in which you will learn a lot about the history of France and the United States around the turn of the 20th century. You’ll learn much less about the history of Columbia, and very little about Panama itself (except that it is the worst place in Central America to build a canal with the exception of all the other places.) So, it was exciting to look out my airplane window and see ships lined up to enter the canal. Also, from the air and from the ground, Panama City looks pretty impressive. 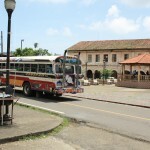 In a country of 4 million people, about 2 million live in Panama (as residents of the Republic of Panama refer to Panama City. Or just “the City,” in a manner similar to residents of the greater New York City area in reference to that city.) 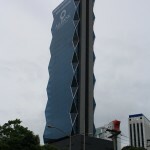 It does not take long, however, to discern that there is the City and there is the Canal but they are not all that makes up Panama. The next three weeks would reveal much more to me about the fascinating mix of people and cultures that sometime blend and sometimes clash to produce a distinct Panamanian identity. Which gets to the point that Panama is not just a thing Teddy Roosevelt made up in 1903. The country has a history which stretches back past the arrival of Christopher Columbus on its shores in 1502, and Panamanians are proud of where they have come from and who they are. 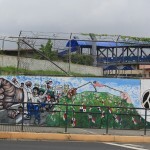 International trade has shaped Panama since the Spanish Colonial period, but even as the United States exercised authority over the canal, students in Panama asserted the sovereignty of their nation. There is a sense in which Panama continues to be denied the respect it deserves on the world stage. 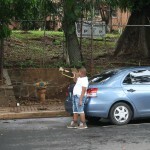 Yet Panamanians do not seem to carry a tremendously large chip on their shoulder. 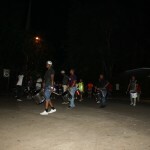 Our group was made to feel very welcome every place we went, and folks in Panama clearly know how to have a good time. 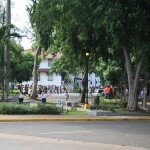 While we have given up so many social activities in favor of the sanctuary of our living rooms, Panamanians are often gathered outside, visiting with one another or perhaps rehearsing the band in preparation for the parades that happen in November. 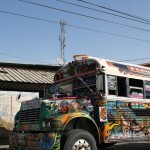 The sacred and the secular get mixed in city blocks and on countryside buses. Over the course of several posts, I hope to be able to share at least a little bit of what I found there.